Do you enjoy working with a collaborative, enthusiastic team? Do you believe that today's schools can leverage technologies to engage and challenge students? Do you love learning? Are you an innovative thinker? If you answered yes to all of these questions, consider becoming part of our Mountain Brook Schools family. Technology Director: The District Technology Director position is the equivalent to the well known K-12 EdTech CTO in other districts across the country. It is a 12 month position and reports to the superintendent. To gain a better understanding of the position, please see the linked job description below. Send all resumes to Dr. Susan Cole, Personnel Director and complete the linked application. If you have questions about the department, position, or team, please reach out to Donna Williamson. Local School Technology Coordinator: Each Mountain Brook School has a full-time technology coordinator housed at the school. Currently, there is a vacancy at Cherokee Bend Elementary, a K-6 school. This position is a 10-month position and reports to both the school principal and the District Technology Director. All applicants should have teaching experience, technical troubleshoot skills, experience in delivering professional development and collaborating with the technology planning team. Excellent coaching skills a must. For more information, contact Donna Williamson. Please send resumes to Susan Cole, Personnel Director and complete the linked application. Innovation: It's What We Do! We believe that technology can be a tremendous tool for assisting teachers to make instruction effective, challenging, and engaging for every one of our students and to increase the efficiency and effectiveness of our operational processes. To accomplish the tasks, we must often seek new ways to utilize existing technologies or research resources not already in place! We strive to ensure that our technology investments are intentional and driven by curricular or operational needs. However, technology in Mountain Brook Schools is not just used for instruction. From our water sprinklers to our air conditioning controllers, from accounting to technology support, from online registration to online payment, every department in our school system uses technology to work more effectively and efficiently. Mountain Brook Schools is a tech-savvy school district where achievement and innovation are common. Each of our six schools maintains a wireless and wired LAN and are connected via a one MB WAN. Our teachers utilize their presentation computers, mounted data projectors, digital document cameras, and sound enhancement systems daily to provide an effective education for every one of our students. Students work collaboratively and individually using a 1:2 ratio of iPads, Chromebooks, and/or laptops in grades K-3. Students in grades 4-12 use iPads, Chromebooks, and/or laptops (1:1 ratio) to engage in real-world experiences and solve problems in our rigorous learning environment. We support three major online learning environments: Google Classroom, Canvas, and SeeSaw. Technology related professional development is available in various formats from face-to-face, in-school and summer workshops, and online assistance. 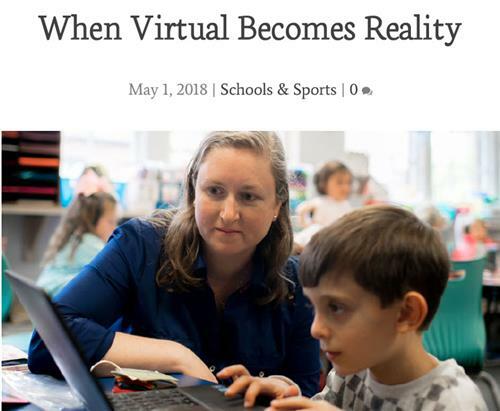 Mountain Brook Schools is fortunate to have a local school technology coordinator at each school to assist with not only learning new technologies but also with integrating the technologies into the classroom practice. We take the online safety and privacy of our students and staff very seriously. Our Data Governance policy outlines privacy and security measures whereas our Acceptable Use Policy (AUP) governs how users interact with the district's technology resources. All G-Suite and Office 365 student accounts are monitored by Gaggle and Internet access is filtered by iBoss. A list of vetted online applications is available for review from the Technology Assist web page. Subscribe to RSS Feed - What's Happening!